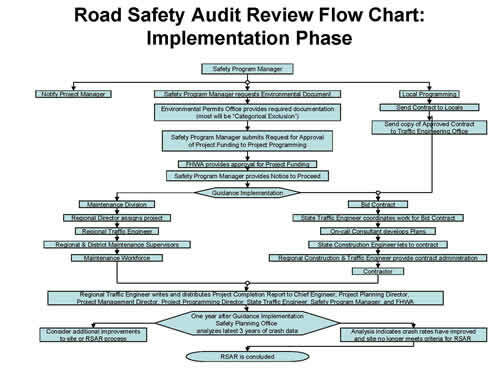 This document defines the procedures used by TDOT to conduct Road Safety Audit Reviews (RSARs). These procedures shall remain flexible so that the overall goal of the Tennessee RSAR Program – to reduce the number of injuries and fatalities on public roads – will be accomplished. RSAR Coordinator –Cynthia Allen of the Project Planning Division is the RSAR Coordinator. The RSAR Coordinator position is the “go to person” of the program. This person is responsible for project scheduling and coordination among all offices involved in conducting RSARs. Project Selection Criteria – The RSAR Program began with some special request projects. Currently, projects selected for the program are spot or section locations on Interstates/State Routes and functionally classified local roads for the Hazard Elimination Safety Program list (HESP list). Projects may also be selected as they are qualified for High Risk Rural Roads funds. 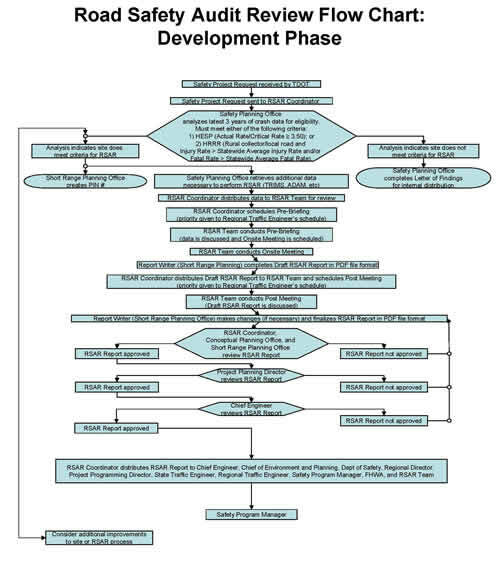 Project Scheduling Criteria – Projects are scheduled in order of their Severity Index (from highest SI to lowest SI), as calculated for the Highway Safety Improvement Program (HSIP) list. Project Funding – When projects are conducted for the RSAR Program, state employees’ time shall be charged to SPR0008. Funding of the roadway improvements provided as guidance in the RSAR reports may come from Hazard Elimination Safety Program funds ($1,000,000 limit per project) or High Risk Rural Roads funds (approximately $50,000 limit per project), subject to the restrictions placed by TDOT process and the Federal Highway Administration. RSAR Report – A RSAR Report is written for each RSAR conducted to document the project and to provide guidance. Reevaluation – The sites improved through guidance from the RSAR Program will be reevaluated. Following one year after project implementation, site will be reviewed for crash history. If no significant crash history is observed, guidance will be considered successful and no further action will be recommended. If crash history is considered significant, a follow-up RSAR will be conducted with possible additional guidance. In addition, the original RSAR team will review their procedures to improve the RSAR process. The Regional Traffic Engineers should be scheduled for no more than one project every four (4) weeks if practical. Regional Traffic Engineer – will attend the RSAR, giving guidance for the site. District Maintenance Superintendent – will attend the RSAR giving information on work that has been performed at the site and what work his department may perform, of the guidance. Conceptual and NEPA Planning Office employee – will use their knowledge of design and to figure costs for guidance. 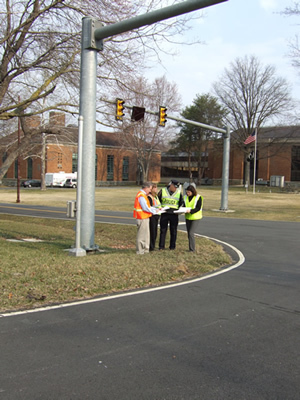 Headquarters Traffic Engineering Office employee – will use their knowledge of safety improvements for guidance. Project Planning Division employee – will be the note taker/report writer. Design Office Employee – will use their knowledge of design and safety improvements for guidance. Others that may be invited are the RPO Coordinator or other member for that county, MPO/TPO Coordinator for that county, TDOT Project Managers, local officials, law enforcement, and others. The RSAR Coordinator will provide the RSAR schedule to the Safety Planning Section so they will have adequate advance notice of upcoming projects. A collision diagram and qualifying criteria for each project will be provided to the RSAR Coordinator by the TDOT Planner or Consultant before the pre-brief meeting. The RSAR Coordinator will distribute data to the team members before the Pre-Briefing. Once the date of the Onsite Visit is scheduled by the RSAR Coordinator, the Pre-Briefing will be scheduled. Team members will meet at a designated location in headquarters. Those team members not located nearby (the Traffic Engineer and District Maintenance Supervisor)/others will be included by telephone conference call. During the Pre-Briefing, discussion should include the crash data, photolog images, maps, purpose of the audit, expectations, and team member roles/responsibilities. The team members will decide the location and time to meet for the audit. The team should decide who will be responsible for photography at the RSAR. That person will be responsible for getting the camera, making sure there is disk space, and charging batteries. The team should also decide who will drive the van. That person will be responsible for reserving the van for the appropriate number of days, getting the Motor Pool Dispatch form signed, obtaining the van from the motor pool, and returning the van to the motor pool. The note taker/report writer will be the team member from Project Planning Division/Short Range Planning Office. That person must take notes of the comments made at the pre-brief meeting and at the site visit so that the report can be written. The Traffic Engineer and/or the Conceptual Planning Office team member will do the cost estimates for the guidance. The Onsite Visit is held by the team to inspect the eligible sites. The team should focus on safety and consider all road users and environmental conditions (day, night, rain, fog, ice, etc.). The note taker should take plenty of legible notes. The photographer should take several pictures of the site from different angles. All team members should discuss with the group their guidance, clearly identifying the improvements by location (log mile or monument),and number/quantity. Example: Add 50 snowplowable makers and 3 chevrons to the curve at L.M. 5.41 to L.M. 5.51 (near Jones Market). After the location has been reviewed, the team should stop and discuss the guidance. Make sure that the notes accurately describe what the team agrees is their guidance. A Cover Page with project name and location, PIN #, the State of Tennessee Seal, and a signature box should be placed on the front of the report. The Header describes the location and date of the project. Description of Project and Background describes the project and provides background information. Include text in this section of why the project was brought to the attention of TDOT to perform a Road Safety Audit Review. Team Members is a list of the team member names, their titles, and the name of their office. Assumptions is an optional section. It may describe future construction plans, anticipated maintenance, or other pertinent information. Information Used in the Review is a list of all data used in conducting the RSAR. Pre-Briefing Summary gives clearly stated safety-related observations, including actual crash rates and state wide average crash rates or crash ratios, which qualify the sites for either Hazard Elimination Safety Program funding or High Risk Rural Roads funding. Observations describes what was actually seen during the Onsite Visit. Photographs taken during the Onsite Visit (preferred) or from the TRIMS Photolog should be included for clarity. Example observation: There are skid marks from L.M. 7.30 to 7.31. Example observation: There is a 58.7 degree curve from L.M. 10.58 to 10.70. Guidance gives exact details of improvements. A Cost Estimate should be provided. It should be prepared by the Regional Traffic Engineer and/or the Conceptual Planning Office. A Map should be included with locations marked where audits were performed. The RSAR Coordinator will be responsible for obtaining the map for the RSAR report. Once a final draft of the report is completed, the team members from Headquarters and other members by conference call should reassemble and discuss it. Any revisions should be agreed upon at the Post Meeting. Once the report is complete and agreed upon, it should be forwarded to Bill Hart. He will review and forward the report to Steve Allen, for final approval. The approved report and associated documentation will be assembled into a file and managed by the RSAR Coordinator. Details for implementation of the guidance are being developed. Suite 1000, James K. Polk Bldg.